The USDA Rural Housing refinance program is for those that already have a USDA rural development loan in place. Unless your current loan is a Guaranteed Rural Housing loan or a USDA Section 502 Direct loan, you cannot refinance into the program. The USDA Refinance is designed to lower the interest rate on a current USDA mortgage and is only available with 30 year fixed rates. 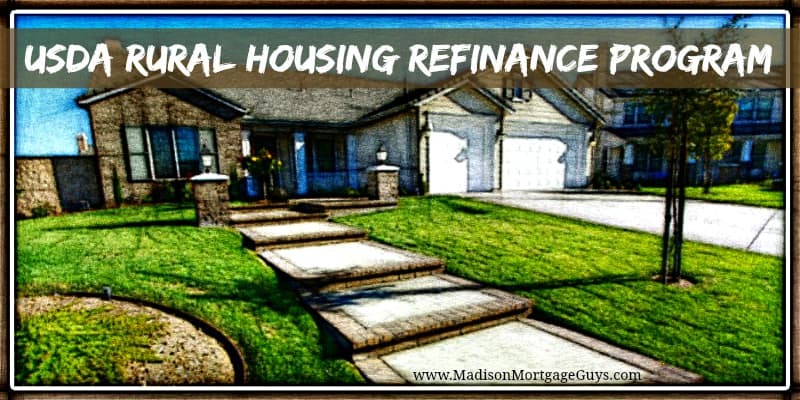 Generally, these refinances are streamlined and can be done with ease. In some cases we won’t need an appraisal if the borrower is willing to pay their closing costs out of pocket. When doing a USDA refinance, we must lower your interest rate and you will not be able to receive cash out at closing or pay other debts with your equity. This also means we cannot pay off any subordinate financing such as a line of credit, 2nd mortgage, or grants. Those liens must be subordinated or paid off. This loan is meant to improve your housing payment. Additionally, borrowers can be added or taken off during the refinance. All borrowers must still qualify under the USDA guidelines. This can be useful in case of a divorce or other change in family dynamic. Your current loan must be secured by the same property as the original loan. The original loan must be Guaranteed Rural Housing (GRH) or USDA Section 502 Direct only. This Program may not be used to refinance FHA, VA, or other government or conventional mortgages. The interest rate of the new loan cannot exceed the interest rate of the loan being refinanced. Income limits apply and can be viewed from our USDA Rural Housing program page of our site. Refinance loans are permitted for properties in areas that have been determined to be non-rural since the existing loan was made. Appraisal is required unless the refinance loan amount includes only the unpaid principal balance with or without the 2% guarantee fee. If an appraisal is done then the maximum loan amount cannot exceed the balance of the loan being refinanced (excluding unpaid fees), plus the guarantee fee, and closing costs, including funds necessary to establish a new escrow account. Additional borrowers may be added to the new loan or existing borrowers may be deleted from the current loan. All applicants must meet all eligibility requirements.